support of Lewis Christian Bohn. 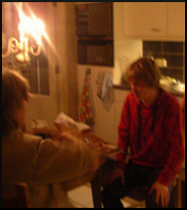 phenomena in their home since Robbert was a child. apparently deposited by the BOL (which was analzyed by BLT) was "magnesium oxide." carbonate. 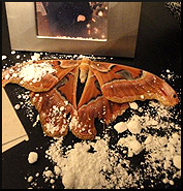 See: eyewitness7.php and 2009whitepowder.php. 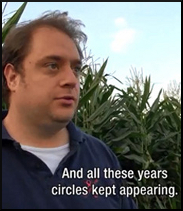 As far as is known Robbert van den Broeke, a young Dutchman who lives in the southern Netherlands' village of Hoeven, is singular in his ability to consistently and accurately predict the appearance of new crop formations in his general vicinity. 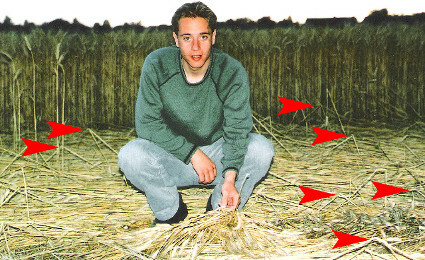 Now 28 years old (2008), he has since early adolescence experienced "visions" which contain both the location and the design of the new crop circle accompanied by a clear sense that the new formation is either occurring at that precise moment or that it will occur soon. 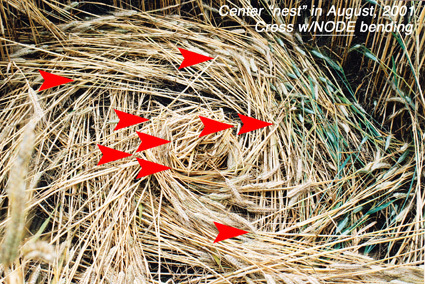 In the days just prior to these experiences he generally feels a build-up of physical and/or mental "angst" (nervousness and tension) which dissipates once the crop circle has actually formed. 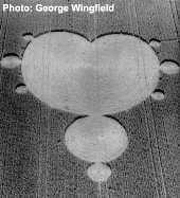 Over the years he has also visually witnessed many crop circles forming, often accompanied by dramatic light phenomena -- although not the same light anomalies in every case. 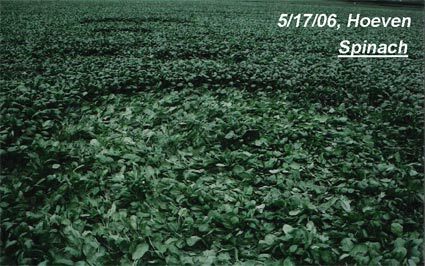 In both daytime and at night he has watched single or multiple spheres of usually bright white or yellowish light hovering over a field (often in the past the field directly behind his parents' home) under which the plants suddenly flatten creating a new crop circle. 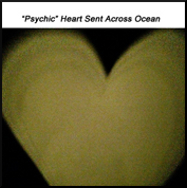 Sometimes he reports seeing simply one or multiple flashes of light, after which a new circle or a more complex formation has been found in the field. 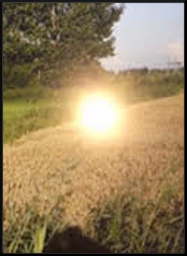 In several cases he has witnessed highly energetic tubes of light descend to the crop surface, resulting in a new formation; for a report on one instance of these witnessed tubes of light, see: bltresearch.com/eyewitness/eyewitness1.php. 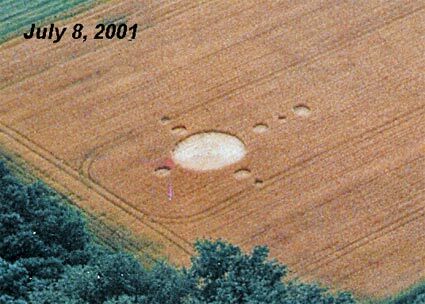 In June of 1999, over a period of two weeks, he observed three circles appear in the same field -- the first two on different nights and the third a week or so later during the afternoon. 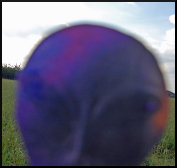 The first circle involved a "pinkish-purple" football-shaped light which flew in at night down low over the field, then became stationary immediately behind his house, subsequently elongating into a hovering disc-shaped light. 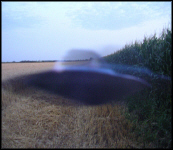 Robbert states clearly that this disc-shaped object was a "light" (not a solid-looking UFO-type object) and that after hovering briefly over the same spot it discharged an "energy" (which he described to me as looking "like the shuttle") down to the crop surface, creating a new circle. In this circle the ground was still warm to the touch when he reached it, less than a minute after it appeared. 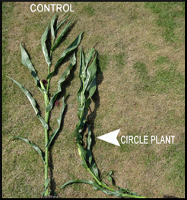 Analysis of the plants from this circle (by two different scientists) revealed dramatic proof of the exposure of the circle plants to an electromagnetic energy source. 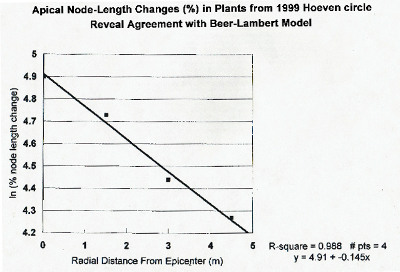 Michigan biophysicist W.C. Levengood found that the apical (top) node-length elongation of the circle plants decreased from the circle center out to the edges as would be predicted by the well-known Beer-Lambert model (which mathematically predicts the absorption of EM energy by matter). Hoeven circle, drying down before shipment to the U.S.
Beer-Lambert model. Graph: W.C. Levengood. 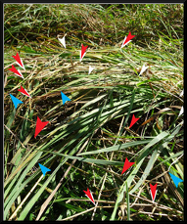 A few nights later Robbert observed simply a "flash of light" out in the same field, and a new circle was found near the first one. And one afternoon a week or so later he noticed a very bright, yellowish sphere of light hovering in a corner of this field, around which the air was distorted in the same manner as around mirages in the desert; as it suddenly "blinked out" he saw a new circle with multiple straight pathways radiating away from it flatten into the crop just beneath where the yellowish sphere had been. 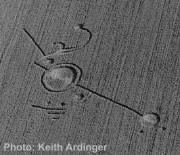 Many of the crop circles which he has either sensed or visually observed occurring have been plain circles or fairly simple groupings of different-sized circles, but many of the formations have been considerably more complex in overall "design." 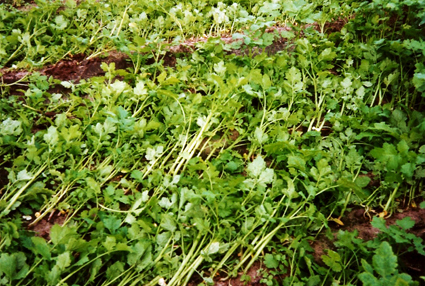 They regularly appear in a wide range of plants, including grasses, wheat, corn (maize), spinach, string-beans and many other crops, often arriving as early in the growing season as April and as late as November. earlier. Photo: Peter v/d Broeke. May 17, 2006. 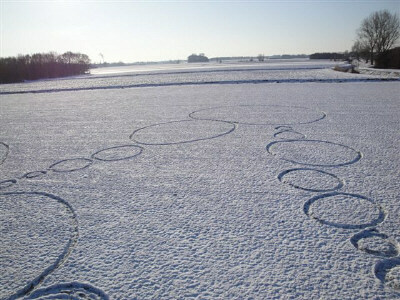 Multiple circles form a "thought-bubble"
Snow circles have also appeared occasionally in winter out in the field behind Robbert's home, and in 2009 several huge snow formations were found in the area of Robbert's "special" field (the place where he first witnessed light-balls creating a crop circle in his early teens). These snow formations are the largest yet known, one being 60 meters long and another 140 meters (bltresearch.com/robbert/snow09.php). 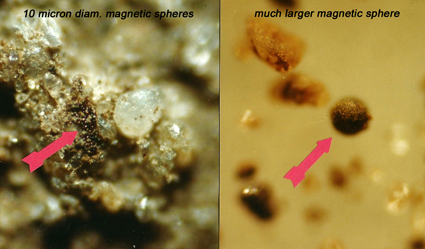 Comparison of snow samples taken from within the rings to controls taken outside them (by FT-IR spectroscopy) revealed no chemical differences whatsoever nor any explanation as to how these rings were formed. at Robbert's "special" field. Photo: Roy Boschman. 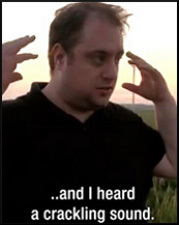 Since 2005-06 he reports with increasing frequency the direct involvement of solid-looking "UFO-like" objects (which he either observes visually or "sees" in his mind's eye) present during the creation of crop circles. See report of a March, 2007 incident: bltesearch.com/robbert/hoeven2007cc.php. He also states that he increasingly experiences both a "UFO" energy (a vibrant, intense sort of feeling) and a "Mary" energy (also intense, but gentle and very loving) as being present both at the time when specific crop circles are forming and afterwards, when he visits the new formations in the fields: bltresearch.com/eyewitness/eyewitness8.php. 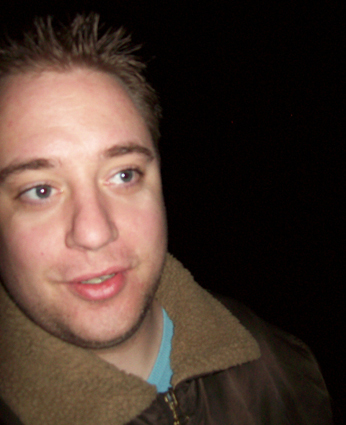 Robbert out in the fields (October 2008). 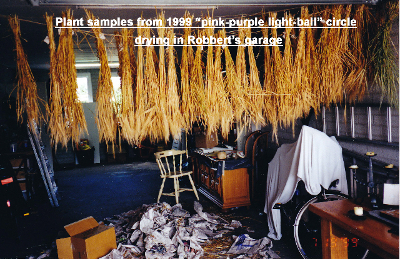 In addition to Robbert's unique recognition of the presence of these unidentified energies which are apparently present just before and during the appearance of crop circles (and often remnant afterwards in the fields), Robbert increasingly exhibits other highly unusual sensitivities. 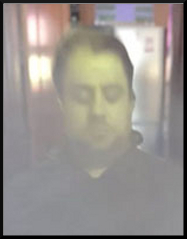 He has become known in Holland as a "medium" of considerable ability (a person with enhanced psychic talent) and now regularly sees clients who have requested healing sessions and/or "readings" (for which there are long waiting lists). This ability to somehow "know" a very wide variety of highly personal facts about anyone can be startling, but I see that he cannot always stop this information from surfacing in his mind's eye. One afternoon at his home I was brushing my teeth in the upstairs wash-room and experienced this situation personally. I had left the door open and Robbert walked by, on his way downstairs. He stopped suddenly and asked me if I had any false teeth? He and I had never discussed such things before and he had no way of knowing that I have for many years had a partial dental bridge (which is semi-permanent and cemented in place). I'm sure the only reason he became aware of it on this occasion was because--for just that instant his attention, his focus, was drawn to my teeth. In the spring of 2008 I visited Holland during Easter. Because Robbert has little interest in most material possessions I have rarely thought to bring him a present, but just before this trip I had a sudden urge to bring him an Easter basket. Not knowing for sure whether the Dutch even knew about Easter baskets, I hand-carried a wicker basket, the yellow cellulose stuff one puts inside, ribbons, a chocolate Easter Bunny, multiple Easter eggs and jelly-beans, and several of the almost-fluorescent yellow marshmellow chickens my family has always called "peeps," and which my mother had regularly included in my Easter baskets when I was a child. Upon arriving in Hoeven I immediately hid all of this material, since I wanted to surprise Robbert on Easter morning. I couldn't stop myself from telling him that I had brought him a present--about which he was curious--but we got involved in other things and he apparently forgot about it. A few afternoons later Robbert came into my room and asked, again, what this present was. Enjoying his curiosity I coyly stated that he had to "wait until Easter," forgetting entirely that it was Robbert I was dealing with. 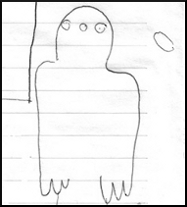 He, not in the least deterred, sat down at my little desk, focused himself for just a few seconds and then, picking up my pen, drew the sketch below. 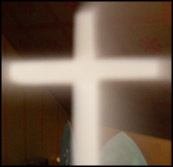 As is apparent, he "saw" even the little yellow "peeps" with their dark black eyes. 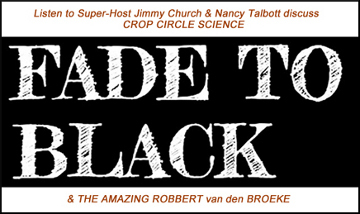 I think it is this same mechanism which provides Robbert with the information about the lives of his clients and which also lets him immediately recognize whether a new crop circle (in Holland or elsewhere) is "the real McCoy." 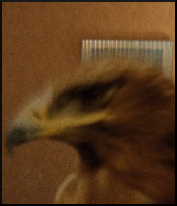 All it takes is a moment of focus, a second or two of him paying attention and the information floods in. 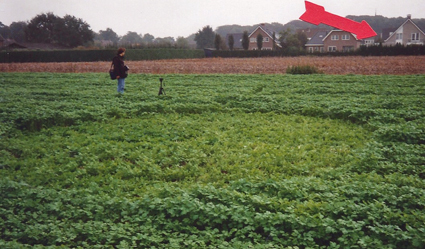 The Robbert van den Broeke case is not only the most complex situation we have encountered during our crop circle research, it also provides evidence that many (if not all) "anomalous" events currently labeled and thought of as separate situations are, in fact, various aspects of the same big unknown. 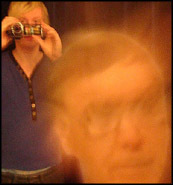 While staying with Robbert and his family every summer I have either witnessed personally or seen evidence of incidents which fall in categories such as "psychic" or "poltergeist" activity, "out-of-body" experiences, "remote viewing," physical "translocation," "lucid dreaming," "ghosts," crop circle formation and "UFO" and "ET" encounters, all of these events documented with thousands of highly unusual photographs taken by Robbert. 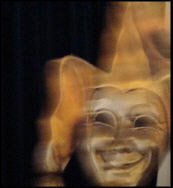 It seems more and more likely not only that these events are inter-related, but also that they involve some as-yet-unknown aspect of what we call "consciousness"--in Robbert's case one that is vastly expanded. 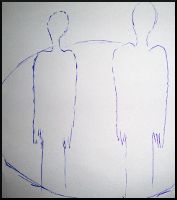 Although we are working on a book in English both Robbert and I think that, in our increasingly visually-oriented world, a DVD might be a better vehicle to reach people. 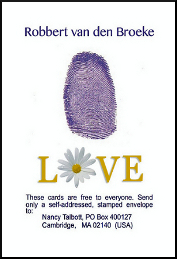 We hope that one or the other, or both, may be available not too far in the future. Click on the video to listen while you read the reports. ROBBERT SEES LIGHT-BALLS & "LASER BEAMS"
People interested in anomalous phenomena & "outside the box" subjects know about debunking efforts aimed at ridiculing people interested in, or who find themselves involved in, inexplicable events. 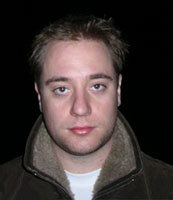 For many years Robbert and his family endured scurrilous & tasteless public attacks. Now these attempts to discredit Robbert have escalated. Most of the earlier debunking was aimed primarily at Robbert's Dutch supporters, but since moving to his own apartment his computer has been repeatedly "hacked" -- and in the last few years Nancy Talbott's computer has been affected also. Nasty emails have been sent not just to Nancy, but to some people on her email and Skype lists, purporting to have come from Robbert (who doesn't know the other people or their email and/or Skype addresses). In 2013 it became clear that Robbert & Nancy's Skype conversations are also being monitored and a series of curious -- and then unwelcome -- images & messages began appearing through Nancy's Skype. 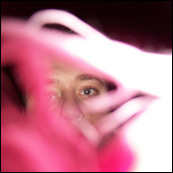 One photo in particular is truly mysterious -- it even caused Robbert to remark that it's cyberspace existence was "weird." And other very interesting things have also been happening. 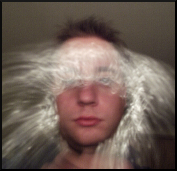 "Automatic" file data on R's digital cameras is increasingly altered by the "energies" which cause the anomalous photos (data indicate photos are taken in the future) and stationary videocameras bolted to tripods have somehow completely changed the direction & angle of their lens...all by themselves. 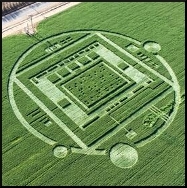 In 2013, for the first time, Robbert got a "message" that apples taken into various crop circles appearing in his area by people visiting these formations might develop the same anomalous markings which have been occurring on apples in his family's kitchen for many years. 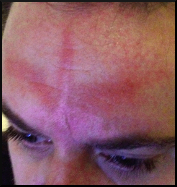 These marks seem to be related to a wide variety of inexplicable events which occur constantly around Robbert, including the regular appearance of new crop formations. 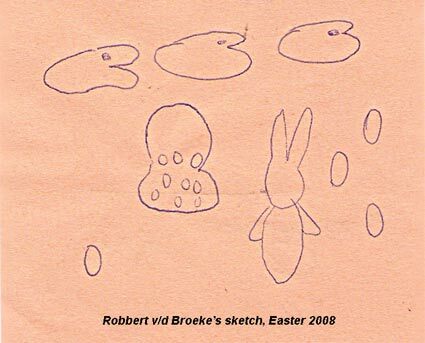 The re-appearance of Robbert's personal spiritual "guide" in his home in July, 2013 and the message she gave Robbert seem to be connected to these markings which subsequently appeared on apples brought into 2013 circles by many visitors. 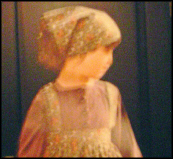 Although "Doya's" physical appearance had been known only to Robbert until 2008, her image appeared several times on Nancy Talbott's camera in a Zevenbergen field, shortly after Nancy had asked if Robbert was still in contact with "Doya." 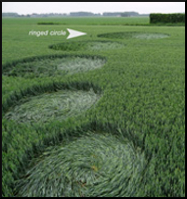 "PSI" EXPERIMENT: ARE MIND-READING & REMOTE-VIEWING RELATED TO CROP CIRCLE PREDICTION?